A 2013 demonstration for better wages and working conditions outside the Wheaton McDonald’s. McDonald’s was one Montgomery County business included in a minimum wage impact study this year. Photo by Stephen Melkisethian on Flckr Creative Commons. Lacefield said participants expressed concern early on about potential negative repercussions to business owners if survey responses were made public. A $15 minimum wage proposal is expected to go before a council committee this fall, after a successful push was vetoed by Leggett in January. Business owners reported negative changes if the bill passes, including a family-run restaurant who may no longer be able to hire high school students in the summer and a franchisee who will stop hiring disabled adults and college interns. A fast-food restaurant franchisee reported already cutting table cleaning staff from eight to 12 employees per shift in 2014 to two or three in 2016, in response to already imposed recent minimum wage increases. Leggett, a Democrat, commissioned the study for $149,600 after his January veto of the legislation from the Montgomery County Council that would have raised the county’s minimum wage to $15 for most businesses by 2020. Businesses have urged council members to wait for the study results. The consultant, PFM, Inc., surveyed 520 businesses in Montgomery County. The Montgomery County Economic Development Corporation estimates the number of businesses in the county is about 32,000. Electronic surveys, focus groups and in-person interviews were conducted over a two-month period in April and May, and a hearing is scheduled for next month to address questions on the study. 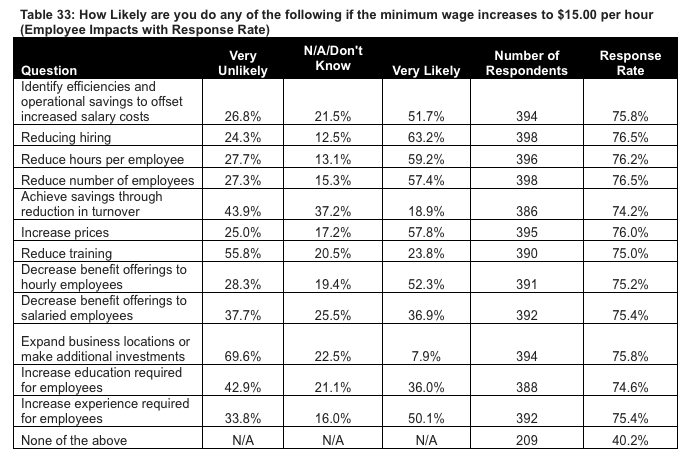 Proponents of the $15 minimum wage legislation are up in arms over the results of the survey, which shows that 65% of businesses in Montgomery don’t support the legislation. County Councilmember George Leventhal, who is term limited and running for county executive, and At-Large Councilmember Hans Riemer, who is seeking re-election, are questioning the authenticity of the survey findings. Surveys were distributed through a professional hospitality association and various Montgomery County chamber of commerce organizations, including Bethesda, Gaithersburg, Kensington, Rockville, Silver Spring and Wheaton. 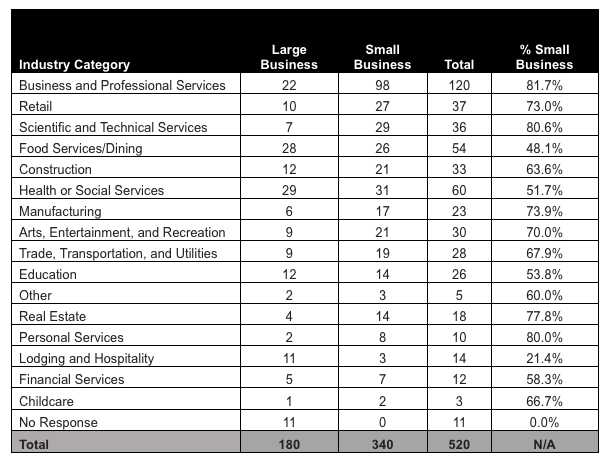 Restaurants, retail stores, landscaping companies, home health care and professional service businesses represented some of the larger industries in the study. All classes of business were included in the focus groups and the surveys, Lacefield said. He cited Dunkin Donuts, McDonald’s and Supercuts as some examples of those surveyed, but even the county doesn’t possess the full list of businesses that participated in the in the study, Lacefield said. Sixty-three percent of businesses predicted they would have reductions in hiring, 59% said they would have to reduce the numbers of hours employees work and 57% said they would have to reduce the number of employees at their business. Joe Richardson III, the CEO of Bar-T, a Montgomery County child care program provider that services 2,500 children a day, participated in the PFM survey. Consultants from the firm interviewed Richardson and Bar-T’s chief financial officer in person. But Richardson said, that many of his employees live in Frederick County so Montgomery families would really be taking the hit. According to conclusions on the economic impacts, the County is projected to lose between 45,000 and 47,000 jobs by 2022 as a result of increasing the minimum wage from $11.50 to $15.00. Low-wage workers would be affected the most. The county would also lose an estimated $396.5 million in income between 2017 and 2022. Sources for the economic impact study included the Bureau of Labor Statistics, the Census Bureau, the Maryland Department of Labor, Licensing and Regulation, the Center on Wage and Employment Dynamics and the National Employment and Law Project. In contrast, other studies cited in the PFM report showed that a higher minimum wage increases employee retention and lowers training costs, produces operational efficiencies and performance standards and boosts morale and mental well-being. Surveyed employers, overall, agreed that increasing the minimum wage would be a benefit to society that would contribute to healthier and happier families. Another study showed that increasing the minimum wage nationally to $15 an hour would end hunger for 1.2 million households. Single parents, non-white households and parents with only a high school degree would benefit the most. Councilmember Hans Riemer, a Democrat who voted for the bill in January, said it is impossible to predict the outcome of a rise in the minimum wage.“I opposed conducting this study from the beginning because I never believed it was possible to do a study that could credibly predict the impact of the minimum wage in the future,” Riemer said.“The many methodological concerns being raised with this study underscore that point. Of course it is critical to be prudent in setting the minimum wage and analyze the impacts as we go. I proposed an amendment which was included in the last bill that required an annual report on the labor market so that the Council could see the results in real time and make adjustments as needed.”On August 3, the Economic Policy Institute released an op-ed titled, “The Montgomery County minimum wage impact study is absurd junk science.”Author David Cooper calls the results of the PFM study implausible. PFM is scheduled to appear before the Council in September to review their findings and answer any concerns about the study. A public hearing is scheduled for September 26. The legislation could be voted on this fall.